A frightening tour through America's gun culture by way of a single weapon -- a semiautomatic hailed by its manufacturer as "the gun that made the '80s roar," and a single criminal -- a troubled Virginia teenager who used the gun in a terrifying rampage. In December 1988, hoping to retaliate against a taunting class bully, 16-year-old Nicholas Elliot walked into his Virginia Beach high school and ended up murdering one teacher, grievously wounding another, and was only prevented from wreaking havoc by jammed cartridges. Wall Street Journal reporter Larson (The Naked Consumer, 1992) is after more than just an In Cold Blood-style narrative of a crime and its punishment. He outlines, painstakingly and chillingly, how the Cobray M-11/9, a weapon originally designed for battlefield use, ended up, like so many other guns across the country, falling into the wrong hands. How could the number of handguns grow so exponentially in America, from 16 million in 1960 to almost 67 million in 1989? The popular culture has fanned interest in them, from westerns that created the mystique of the American rifleman to media accounts of shooting sprees and movies and TV episodes that have boosted sales of exotic weapons. But Larson also finds "a de facto conspiracy of gun dealers, manufacturers, marketers, gun writers, and federal regulators" that have fed the huge demand. 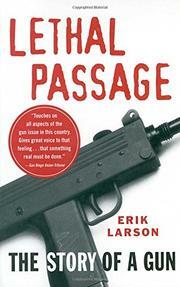 In the course of his research, Larson attended gun shows, visited a self-defense class that teaches women how to shoot, applied for and received a federal gun dealer's license, and interviewed a mail-order merchant of how-to guides to murder and the owner of the gun shop later found guilty of negligence in selling the handgun. He describes how the hard-core leadership of the National Rifle Association continues to hold sway over a more moderate rank and file and explains the workings of the toothless agency designated to enforce the nation's few gun laws, the Bureau of Alcohol, Tobacco and Firearms (e.g., gun purchase records remain in the hands of gun dealers, who can obstruct the work of ATF agents). An urgent and, after the Long Island Railroad massacre, sadly timely wake-up call to stop America's "new tyranny" of gun violence.